Club Carlson has launched two promotions for stays at participating Quorvus Collection, Radisson Blu, Park Plaza and Park Inn hotels Europe, Middle East & Africa. You can get 10,000 bonus points for a two nights weekend stay or/and third night free for stays between September 15 – November 15, 2015. The weekend is defined Friday, Saturday and Sunday nights except in Middle East where it is Thursday, Friday and Saturday. The third night free requires you to book a specific rate plan while the 10,000 bonus points only points eligible rate plan. Hotels may be participating in one of the offers or both. Check the list at the bottom of this post. You should be able to combine these promotion as long as the hotels are on the both lists. There are the second night free and four nights at the price of two (read more here and here) offers for Gold and Concierge member weekend stays in the same region. This Offer is valid for a single new booking made between September 15th, 2015 – November 15th 2015for a minimum two-night stay at a rate eligible to earn Gold Points completed on or before 15 November 2015 with an arrival on a Thursday through Sunday (an “Eligible Stay”). Booking has to be made by clicking on the “Book Now” button in the Offer e-mail or online via clubcarlson.com or the brand websites. 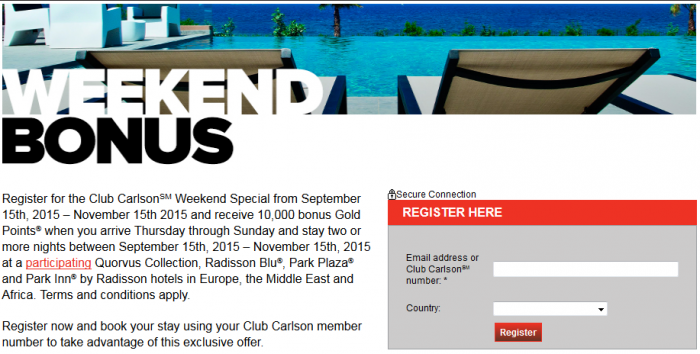 To be eligible to earn 10,000 bonus Gold Points for this Offer (“Bonus Points”), you must register online by 15 November 2015 at clubcarlson.com/weekendspecial. Members only need to register once, but registration must be received before checkout of the Eligible Stay to qualify. You must provide your Club Carlson member number at the time of booking or at check-in for the Eligible Stay to earn the Bonus Points You will receive your Bonus Points after the completion of the Eligible Stay. Bonus Points are in addition to the standard Gold Points awarded for the Eligible Stay.